They count among the bestselling vehicles in the country, and their popularity is still growing. Ferdi de Vos, with some expert assistance, pitted seven double cabs against each other to find the best leisure bakkie for your next road trip. The trend started nearly four decades ago in 1979 when Toyota included a 4×4 model in their Hilux line-up. Five years later, the Japanese carmaker completely broke the mould by introducing the first double cab 4×4 in the fourth generation Hilux range. It created a significant new segment within the one-ton market, as family and recreational users could now benefit from the increased versatility of a light pickup. Other manufacturers, such as Nissan (Hardbody and Navara), Mazda (initially with its B-Series and, from 2006, the BT-50), Isuzu (KB), Mitsubishi (Colt and later Triton) Ford (Courier and now Ranger), followed suit. Soon these leisure oriented bakkies started to feature on the top-seller list of the local market, and with the commissioning of local production in the ’seventies, they became a South African institution, like biltong and braai. For over 40 years the Hilux has been leading the charge, only once being outsold by the KB during this period. But, since the new Australian developed Ford Ranger joined the fray in 2010, the position of dominance held by Toyota has been challenged on occasion. Meanwhile, Volkswagen released its Argentinian-built Amarok pick-up, Isuzu introduced its sixth-generation KB locally in 2013 (updating it with some running changes and a 4×4 auto two years ago), Ford overhauled the Ranger extensively, and Toyota revealed the eighth incarnation of the Hilux. The Mazda BT-50, initially built locally with the Ranger, has meanwhile been upgraded and is now imported from Thailand; as is the case with the latest Mitsubishi Triton, introduced earlier this year, as well as the Fiat Fullback, manufactured in the same plant as the Triton. 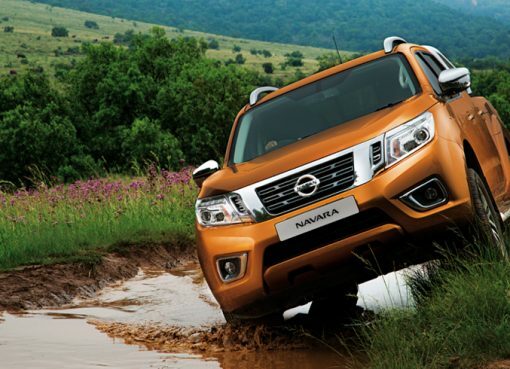 Also, Nissan debuted its long-awaited new third-generation D23 Navara, earmarked for local production, and Volkswagen recently made the V6 derivative of its Amarok available on local soil. With so many derivatives, and with the majority of private buyers in this segment opting for auto transmissions, we decided to narrow down our comparisons and only pit the top-level diesel chargers from the different brands against each other. However, with no recent changes made to the top-line diesel Isuzu KB, it was decided not to include it in this test. This left us with the special edition Ranger 3.2 TDCi Fx4 (based on the XLT auto 4×4), the secretly sneaked in Fullback 2.4 4×4 auto, the imported BT-50 3.2 4×4 SLE auto, the recently introduced Triton 2.4 Di-DC 4×4 auto, the Navara 2.3D LE 4×4 auto, the special Hilux 2.8 GD-6 4×4 Black Edition, and the burly Amarok 3.0 V6 TDI 4-Motion auto Highline Plus. Let the battle of bakkies begin! All seven contenders were assembled at Klipbokkop Mountain Reserve near Worcester and, over a period of two days, the evaluation team subjected them to a battery of tests. These included acceleration tests on rough tar (measured with a V-Box) and a combination of gravel and sand, braking tests, a wheel articulation test, a static evaluation, as well as a standard road course over a variety of surfaces (tar and gravel). The following were evaluated: exterior design, interior design (including fit and finish and ergonomics), interior features (comfort and convenience, infotainment system, and safety features), performance (engine and transmission), ride and handling (including off-road performance), fuel economy, and peace of mind (warranty, service plan, after-sales service, etc.). As aesthetics are subject to personal taste, trying to justify a preference is not a very useful exercise. Suffice to say that our judges (consisting of four seasoned motoring scribes and a renowned 4×4 expert) rated the more angular styling of the Amarok just ahead of the Ranger, Navara, and Hilux. The styling of the Fullback and BT-50 (interestingly, both based on donor platforms from the Triton and Ranger respectively) were described as a bit bland with less aggressive frontal treatment in comparison to the others. In terms of interior design and layout, the Hilux and Amarok stood out once more, followed closely by the Navara and Ranger. However, when it came to features and equipment, the Nissan, Ford, and Toyota were rated highest. The interior of the Amarok exudes an ambience of spaciousness, quality and class, and (in true VW fashion) the layout is unpretentious and uncomplicated. The sleek and modern interior of the updated Ranger felt car-like, featuring stylish and attractive yet durable materials and trim. Gone are the fussy central controls, while a central touchscreen and new dual-TFT cluster behind the steering wheel provides all the necessary information at a glance. The Hilux cabin has recently been updated with padded door armrests, Piano Black door trim, and a soft-touch leather centre console lid. However, our Black edition, with floating flat-panel touch screen above the centre console and full colour TFT multi-info driver display, was introduced before these updates. Cool blue illumination heightened the sense of elegance, and while the patterned material seat upholstery may not be to everyone’s taste (leather is optional) the seats are well designed and comfortable. Nifty features include an air-conditioned cool box, cup holders in front of the air-con air vents, a handy recessed storage compartment, and grab handles at the rear. The cabin of the Nissan, tastefully adorned in dark trim with chrome surrounds, is contemporary and modern, but the use of some hard plastics detracts from an otherwise classy interior. However, it is the only contender with standard sat-nav as part of its infotainment system, and it now also has larger rear doors, resulting in more rear legroom. The Triton (and the Fullback, by default) has a roomy cabin and offers good levels of comfort, but it lacks the upmarket ambience and comprehensive features (it only has two airbags, for instance) offered by the Ranger, Hilux, and Navara. The Fiat also has only two airbags, and no steering wheel controls –offering the least in terms of features of all the contenders. 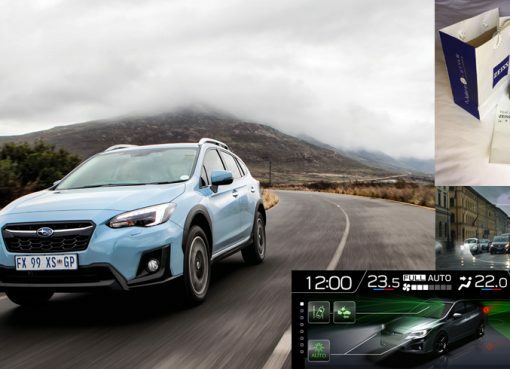 The Mazda, now fully imported, displays good build quality and is quite well-appointed inside but its interior lacks the solidity and superior plastic trim of the Ford on which it is based, as well as the impressive Sync3 infotainment system. Incidentally, the Isuzu KB, while not included in this test, disappoints in terms of interior refinement, and while the specifications are all good, it lacks the finesse and style needed to compete at this level. The Ranger and its BT-50 cousin, both powered by Ford’s 3.2-litre Duratorq TDCi five-cylinder diesel engine, producing 147 kW and 470 Nm of torque, are no longer the most powerful bakkies in this segment. 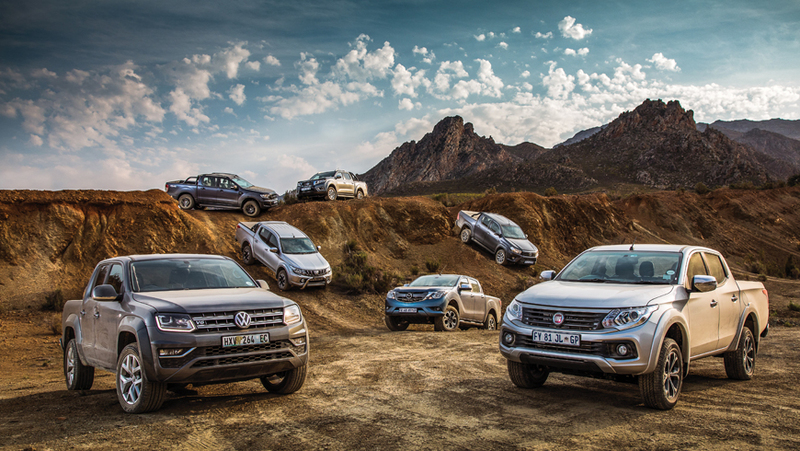 This distinction now belongs to the long-awaited V6-powered Amarok. With a 3.0-litre TDi engine delivering 165 kW and 550 Nm of torque, the VW was the quickest in our sprint test – blasting from standstill to 100 km/h in 8.47 seconds. However, it struggled on gravel, as all that power channelled to its wide 19-inch Pirelli Scorpion tyres made it difficult for the 4-Motion system to find grip. One would have expected the Ford and Mazda to be runners-up in the 0-100 km/h sprint, but the weighty pair were both outdragged by the Triton (11.03 seconds) and Fullback (11.32 seconds), as well as the Navara (11.45 seconds) – all of which are fitted with less powerful, smaller capacity engines. Fiat initially launched the Fullback with the older generation 2.5-litre mill by Mitsubishi, but now has quietly made available its 2,4-litre version, which makes use of the same Di-D DOHC Mivec engine (133 kW/430 Nm) as in the Triton. While less powerful than the Nissan’s 2.3-litre twin-turbo powerplant (140 kW/450 Nm) the Mitsubishi engine is smoother and more flexible, giving it the edge in terms of overall usability. The 2.8-litre four-cylinder GD engine in the Toyota offers a stout 130 kW and 450 Nm of torque, but, while smooth and well-balanced, it was no match for the others in the acceleration stakes; the Hilux recording a time of 13.35 seconds. In this market segment, sprinting prowess does not count for much, while on-road and off-road performance is decisive. Most important is ride quality and comfort, as these vehicles will, apart from doing long-distance trips, spend most of their time being used for the daily commute.Their workhorse origins dictate sturdy ladder-frame underpinnings, and six utilise a double-wishbone front suspension and leaf-sprung rear suspension. The exception being the Navara, with a 5-link coil suspension.This setup gave the Nissan an edge on rough gravel roads, but most of the judges felt it did not make a major difference on tar; the ride quality of the Navara (perhaps owing to its oddly sized 255/60R18 tyres) still being on the firm side. Equally, the setup of the Triton felt less forgiving than that of its Fiat counterpart, even though Mitsubishi assured us there is no difference in suspension settings. In terms of ride comfort, the Hilux now measures up to the BT-50, Ranger, and Amarok on tar surfaces, but it was slightly bouncier over rutted surfaces. However, low cabin and engine noise, and improved NVH levels further contributed to its drive comfort.The Amarok and Ranger shared these traits, but cabin noise in the BT-50 was higher, possibly because less sound-isolating materials were used in its construction. The smaller four-cylinder mills in the Triton, Fullback, and Navara were noisier on the road, but never unpleasantly so.However, the engine and drivetrain combination in the Mitsubishi and Fiat is excellent, ensuring outstanding driveability thanks to well-chosen ratios for the 5-speed ’box. This also applies to the Toyota, and similarly, optimal shift points for the 8-speed transmission of the Amarok ensure seamless cog-swops. In terms of handling, there was not much difference between them. They are all competent (the Amarok benefitting from its permanent 4WD system) and, despite their size, quite nimble in the corners. Steering assistance and input are accurate enough on all of them, but the steering of the Ford felt too light at slow speeds, and the turning circle of the VW is still too big. They are also closely matched on safety; all endowed with a cluster of airbags (except the Triton and Fullback with only two) and a compatible list of system acronyms. 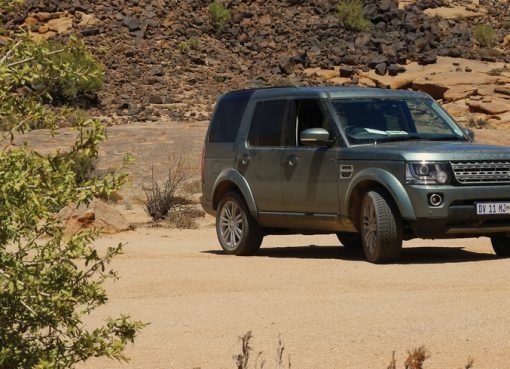 While they probably will never venture far off-road, good cross-country skills are still expected from our seven contenders; even if only for peace of mind, or bragging rights, perhaps. Anyway, all of them now use rotary dials to electronically select two-wheel or four-wheel drive and, apart from the Amarok (equipped with VW’s 4Motion Torsen differential system), all of them use a low-range gearbox and rear differential lock for better traction off-road. The Amarok has a torque converter that allows for better response at low speeds and less slip resistance, and a first gear configured as a low range gear. The system works surprisingly well, and the off-road ability of this powerful German steed should never be underestimated. With superior approach, departure and break-over angles, good ground clearances, impressive wheel articulation, and an array of electronic driver support systems, the septuplet of these double-cabs can handle extreme terrain with ease. Still, the Ranger and BT-50’s longer wheelbase and limited front wheel articulation (owing to a heavier engine) can compromise their off-road abilities in extreme conditions. While the Amarok V6 is undeniably the best in terms of on-road performance and overall refinement, the Toyota was adjudged the more versatile vehicle, the one that did not win any test category, but fared well in all aspects of it. In the end, though, it was the huge price difference between the two that was the tiebreaker.